The Kronos slots game is a pretty basic game with a soundtrack effect as a lovely and very relaxing musical background. If you have imagined playing with the Gods of Mount Olympus, now you have that opportunity with the game of Kronos, do not miss it. Your moment is now; try your luck with the Gods. Like other games of Gods of Mythology with WMS slot machines like White Orchid, Amazon Queen, Crystal Forest, Lord of the Ocean, Michelangelo or Rainbow King, the Kronos game offers you a series of additional functions, rounds of free spins, stacked symbols and many opportunities to multiply your winnings. Kronos, a character in Greek mythology, part of the group of the first generation of strong titans, was the son of the Goddess Gaya, Goddess of the earth and Uranus, God of heaven. This slot game has been created with the aim of overcoming other similar mythological slot games like the slot game of Zeus and Zeus III. Once you start playing with Kronos you will feel as if you were making a real visit to the Greek temple, surrounded by the most impressive and fabulous legend characters in all the mythological settings of the time, as a God and a true titan with the winged horse Pegasus and other divine and legendary creatures. 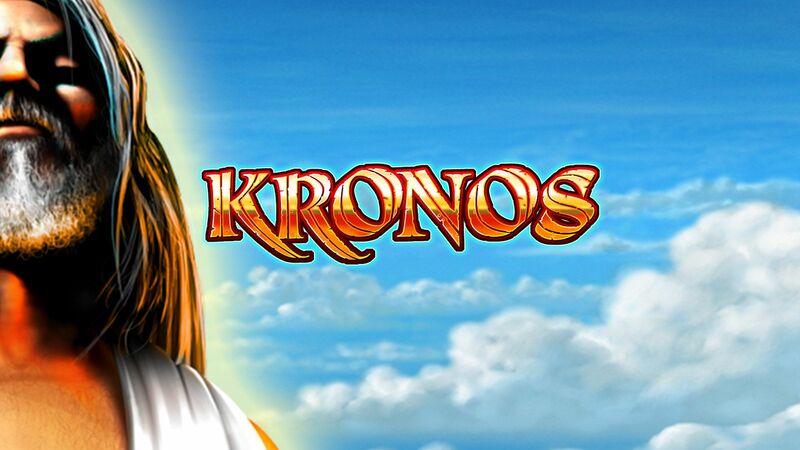 Kronos is presented in a slot machine with 5 reels and 20 pay lines created by WMS Gaming. This new generation of Kronos slot machine has been very popular in the United States of America, especially in the city of Las Vegas, but it is not until recent times that they make their appearance in countries of the United Kingdom, where it is expected to reach such a level popularity too. The Kronos slot machine presents options like the stacked symbols and Free Spins function; to activate the Free Spins it is necessary to place 3, 4 or 5 golden scatters in a Logar with the naked eye, and the number of scatters will be the one that fixes the number of free spins that can win. Then 3 medallions will give you 10 spins, 4 medallions will give you 25 spins for free and 100 Scatters will give you the opportunity to achieve up to 100 free spins. This function will be activated in a single opportunity during the game. The scatters is presented in the form of gold medallion symbols, you will also find another series of symbols related to the mythological theme such as the ornate rings, the Kronos temple, the Olympus mountain, the winged horse Pegasus, the golden throne, the Kronos own and his treasure. The wilds are represented by the image of a roaring Lion but can only appear in the middle of three reels. The stacked symbols of wilds and Kronos give you more chances to win a great victory and multiply your winnings. With the benefit of the Kronos stacked symbols, you can get the profit of 2250 coins and continue to enhance your line of play. For a better gaming experience we recommend you to adjust your bet before starting the intense treasure hunt of God Kronos, choose the number of active game lines and to choose the value of the coin between NZD0.01 and NZD3.00 you must activate the Bet button / Line and to put the reels to spin, press the option “Rotate” or automatic play according to how you want to play, if you cannot do it manually. Most of the highest prizes are achieved especially through the stacked jokers that can make their appearance during the function of free spins, for this, just wait for your moment as this function is a bit difficult to activate. This slot machine currently represents one of the best models of the G + series or a new generation of WMS slot machines. In addition to the slot machine of Kronos, there are also others such as Zeus, The Palace of Riches, Buffalo Slots, Super Jackpot Party, Bruce Lee, which are also very popular among slot players created by WMS. The wild cards only appear on reels 2, 3 and 4. The scatter symbol is presented like the gold medallion and the lion is the wild symbol that can replace all the other symbols on the reels. To set in motion the free spins round you need to get three or additional gold medallions scattered on the reels, three gold medallions give you ten free spins, four gold medallions will give you twenty-five free spins and 5 gold medallions, they will give the opportunity to obtain the maximum prize of 100 free spins. It seems very difficult but it is not impossible. The Kronos slots game also offers you some stacked symbols, which increases your chances of creating winning combinations that bring you closer to the jackpot. It also offers you a chance to win bonuses, called free spins, an event to increase your chances of winning. The Kronos symbol creates powerful combinations to win from side to side. Play and get the feature symbol, which will allow you to get rewards in the form of free spins that can be multipliers of the other prizes you achieve. Increase all your chances of winning with all these special symbols and predetermined functions. The figures of diamonds, spades, clubs, and hearts are the symbols with a lower value that can also be found in the game. They are symbols of the card game that also make their appearance. Accept the challenge of winning to the fullest with this entertaining game, get all the riches that you have never managed to imagine with the unique and powerful God of time and eternity, within this unique theme and live an epic and divine game experience. Always bet on the 20 lines of play offered by the Kronos slot machine and start earning the winnings you want. Win all the prizes offered by this game and fill your pockets. Choose the number of bet lines you want to play in classic or manual mode. Invoke all the power of the krono God and throw yourself into your near future full of a lot of money, a future worthy of a God. If you still do not feel ready to bet real money on the Kronos slots game, try the demo version and once you know the dynamics of the game and start to feel like a true God, play with real money and relive all the prizes destined for you. If you are ready to bet, you can choose between some of the default functions, activate the quick bet mode offered by the Kronos game and increase your chances of winning. Start dreaming surrounded by opulence and wealth. Invoke the wild symbol that can replace any other symbol on the betting line and make it an award-winning line. Reach divine glory with one of the most popular mobile slots in the market today, equipped with an original theme and a fantastic recipe for fun and fabulous victory opportunities. This dynamic and entertaining game full of action has all the necessary features to satisfy the most demanding tastes. Fans and players are looking for insatiable maximum fun in the games they choose, great prizes and a fair and satisfying game experience, with minimal risks and lots of animation. Always WMS is at the forefront of the highest demands, developing the best gaming system.